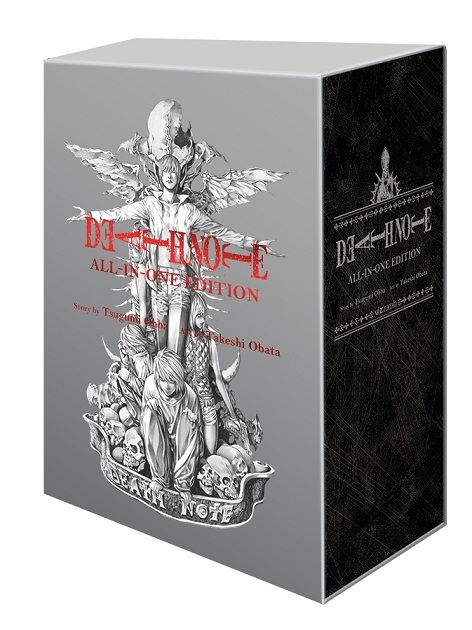 VIZ Media, LLC (VIZ Media), a premier company in the fields of publishing, animation distribution, and global entertainment licensing, delivers a landmark release to DEATH NOTE fans with the DEATH NOTE All-In-One Edition. An exclusive print release, the now-available omnibus combines all 12 volumes (that’s 2,400 pages) of the hit supernatural crime thriller into a single massive tome, which is presented in a beautiful silver slipcase. An extraordinary collectible and a must-have for manga fans, the new edition also contains an epilogue chapter that has never before been published in English. In DEATH NOTE, Light Yagami is an ace student with great prospects – and he’s bored out of his mind. But all that changes when he finds the Death Note, a notebook dropped by a rogue Shinigami death god. Any human whose name is written in the notebook dies, and now Light has vowed to use the power of the Death Note to rid the world of evil. But when criminals begin dropping dead, the authorities send the legendary detective L to track down the killer. With L hot on his heels, will Light lose sight of his noble goal…or his life?